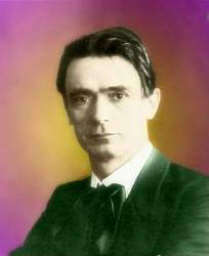 In the Introduction, Virginia Moore says, "Clearly Rudolf Steiner belongs to an age-old stream flowing sometimes above ground, sometimes below, but never, since the beginning, dry." Never one to be bound to "the aridity of matter-bound thinking"[VM] Steiner is rather the marathon swimmer who swims the length and breadth of this ageless stream, stopping at points along the way to describe the scenery, enticing us to explore the stream ourselves. At one early stop he shows to us some men who instinctively remember the experiences of their fathers and grandfathers. At another place in the stream we meet men who experience ideas flowing into their minds as water flows into our bodies -- a bounty from the large mass of the earth. (The concept of ideas and thoughts arising within our minds would have to wait for a paradigm hop of consciousness farther down the stream.) At another resting place we observe spirits of the recently deceased finding their way upwards by following the architectural lines of pyramids and spires. At another we see a man whose trunk and limbs in one life transform into his head in the next life. In the stream, we observe everywhere colorful soul-spirits and follow them into their earthly incarnations as they garment themselves in the splendid colors of their being in the spirit world. 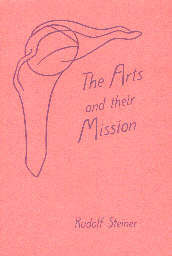 From our tutelary sessions in the stream with Steiner, we ken the spiritual essence of the various arts: how the entrance of the soul-spirit into the world creates costuming, how the focus on the present time freezes a human body into sculpture, how the exit of soul-spirits from the material world creates the need for architecture, how the soul-events in paintings occur in two-dimensions with color as the third perspective, how the lower earth gods (e. g., Dionysus) appeared as actors on the dramatic stage before man did, how the upper gods (e. g., the Muses) infused man with poetry and song. As we drift in the stream, we hear from the banks, Homer pleading to the gods that their will be done, not his, as he opens the Iliad: "Sing, oh Muse, the wrath of Achilles, son of Peleus." And, lastly, we pause in the stream of today, "when man is in the process of becoming free, daimonic man, that is, man under the influence of tutelary spirits is an anachronism." [RS, italics mine] Looking back over our trip in the stream, we realize that we have seen man evolve in consciousness, from Homer, who required the tutelary advice of his Muse, to Modern Man, who shuns parental injunctions in favor of the complete freedom that only autonomy can bring. "Once upon a time," or as we may now say it: Many paradigm hops ago, "the daimonic led to tragedy. "[RS] Today, in complete autonomy, we can say, "There are no innocent victims"[BM] -- that each one, partly in consciousness, partly out of consciousness, has complete control over the events of one's life. Finally we pause in the stream to consider Goethe's triad, "Wisdom, Semblance, and Power." Wisdom, Steiner sees as "formless knowledge," Power as virtue, or "the power to carry out worthwhile things effectively," and Semblance, as art, "the beautiful." I see Goethe's triad as a four-part process that mirrors Don Robinson's Habit Formation steps: 1. Unconscious Incompetence (Power, will, virtue), 2. Conscious Incompetence (Action Semblance -- performance arts), 3. Conscious Competence (Word Semblance -- literary arts), and 4. Unconscious Competence (Wisdom, formless knowledge). In the progression through each of these four steps humankind makes a paradigm hop and consciousness evolves. The stream is actually a cascade of falls, each one marking a jump in the evolution of consciousness for the salmon-like human race heading for its spawning grounds upstream.